When the first Folkestone Triennial debuted in 2008 in the sleepy English seaside town of Folkestone in Kent, it seemed like a big ask. Twenty-nine internationally acclaimed artists including Tracey Emin, Mark Wallinger and Jeremy Deller were commissioned by White Cube curator Andrea Schlieker to contribute brand new artworks to be installed around town, some to remain on a permanent basis. It was a stroke of genius that immediately put Folkestone on the cultural landscape, blowing away all traces of candy floss and 'kiss me quick' hats in one fell swoop. Once again, for 2017, major artists are showing works in various locations around town, including David Shrigley's quirky 'Lamp Post' on The Leas. 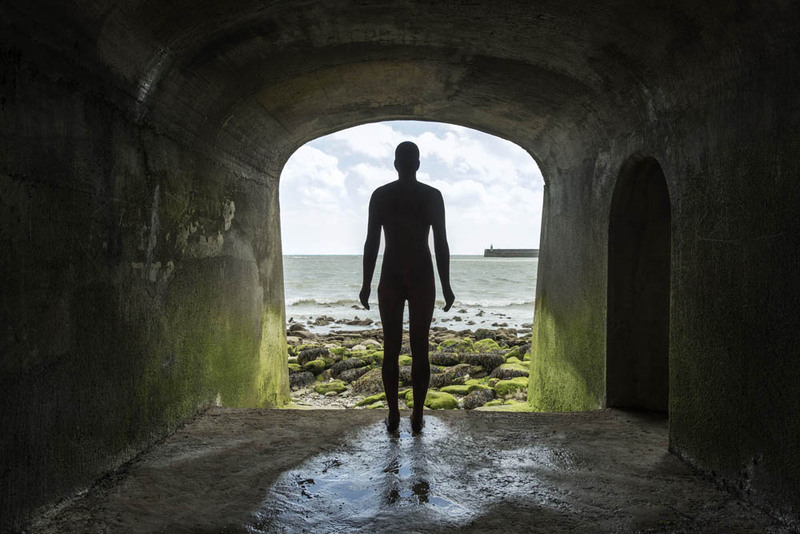 Perhaps the best known is sculptor Antony Gormley who has secreted two cast-iron figures from his 2013 ‘Another Time’ series around Folkestone Harbour. Michael Craig-Martin's ‘Folkestone Lightbulb’ adorns the exterior of a building at the junction of Tontine Street and the Old High Street in Folkestone’s Creative Quarter, and within the same building is a ‘come and play’ workshop set up by Bob and Roberta Smith who has declared that ‘Folkestone Is An Art School’. His signature typography can be seen on signs and banners everywhere and accompany 12 short videos and an inclusive teaching facility and programme. Also in the Creative Quarter is a fleet of gilded ships by Jonathan Wright, 3D-printed replicas of fishing vessels based in or operating out of Folkestone Harbour. These glittering boats are located above eye level atop lampposts in Tontine Street. Educational space The Cube, also in Tontine Street, has been in need of a repaint as its original red coat faded over the years. New York-born artist Sinta Tantra has wrapped it in an eye-catching abstract pattern inspired by the designs of French artist Sonia Delaunay. Six colourful mini bungalows by designer Richard Woods are dotted around Folkestone in unusual places. On the beach, floating in the harbour or secluded on a clifftop, Woods’ ‘Holiday Home’ is a poignant statement on second homes and the current housing crisis in the UK. His collaborations with Brit design brand Established & Sons and Danish studio Hay have made him a longtime Fizz fave. A house of a different kind can also be found at sea level. Open sided, Sol Calero’s bright ‘Casa Anacaona’ sits on the shingle inviting you to sit and take in the sea air. With drawings and painting from local children and creatives, and vibrant furniture, it’s the most cheerful and humorous exhibit on display. In complete contrast, around the corner in Folkestone's small sandy bay, stark black angular graphics by Gary Woodley snake around under and over the concrete walkway at the rear of the beach. 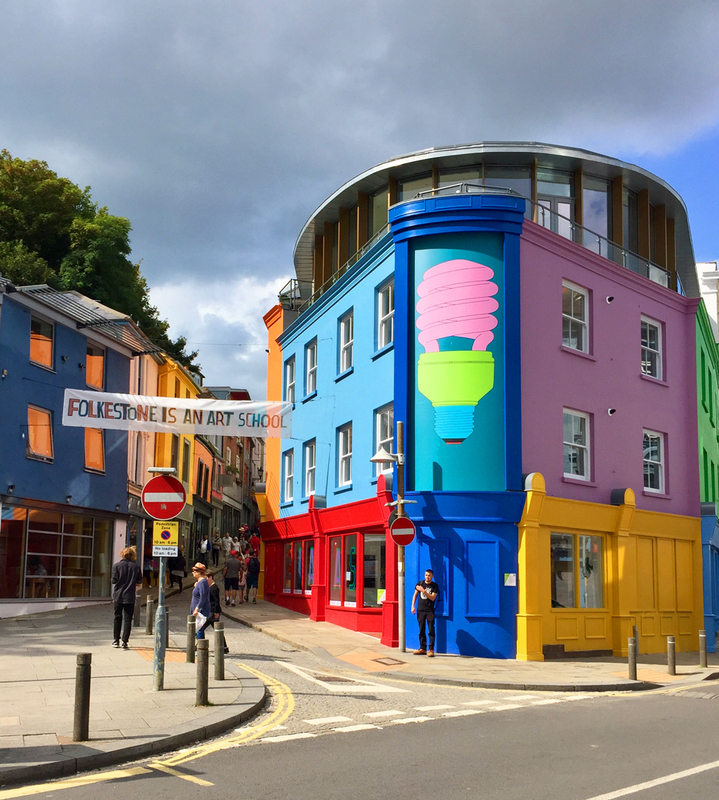 Animating Folkestone, the Triennial encourages visitors and residents alike to explore areas beyond the central shopping streets. Equipped with a comprehensive map you can follow a treasure trail from warren to beach, clifftop to harbour, in search of artworks old and new. This can be thirsty work but luckily there are plenty of tempting spots to refuel. The harbour arm itself now has a number of bars and eateries including a champagne bar in the old lighthouse right at the far end. Mark Sargeant’s Rocksalt, the first notable restaurant to open in town, serves up freshly caught seafood and brasserie-style cuisine and has a first-floor terrace where you can perch for cocktails or tasty bar snacks. Sargeant also owns The Smokehouse, just behind Rocksalt, Folkestone’s finest chippy. Hang out with the hipsters in the Lime Bar Cafe on Tontine Street or head to Steep Street cafe on the Old High Street for coffee and small bites. The Old High Street is also where you’ll find a clutch of stylish independent shops, such as Kitty McCall, Atelier Feralchild and Maison Marine, as well as stalwart vintage accessories store Rennies.